Our adjudicator this time was Canon Lisle Ryder, to whom we were very grateful for taking on the task at relatively short notice. He admitted to having failed O level English Literature but had been inspired to write poetry after a Poetry Retreat at Rydal Hall. Lisle’s other interests include enjoyment of art and paintings. Third – Cathy Grimmer with ‘The Head’. This was a story about an artist so inspired by her mother’s letter that she unwittingly sculpts her father’s face as she would have wished him to be. 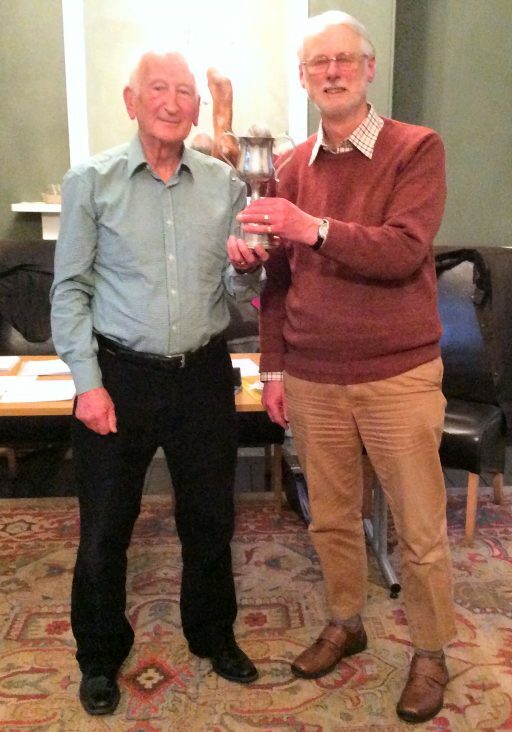 In Anna’s absence Lisle was photographed presenting the trophy to Phil, whose story was a tale of revenge told from three points of view. A woman slighted by a fellow member of an Am Dram group writes a scathing review for the local paper of its next production. President David McAndrew gave a vote of thanks for the adjudication and presented Lisle with a ‘Thank You’ envelope plus a copy of our group anthology ‘Pieces of Cake’.